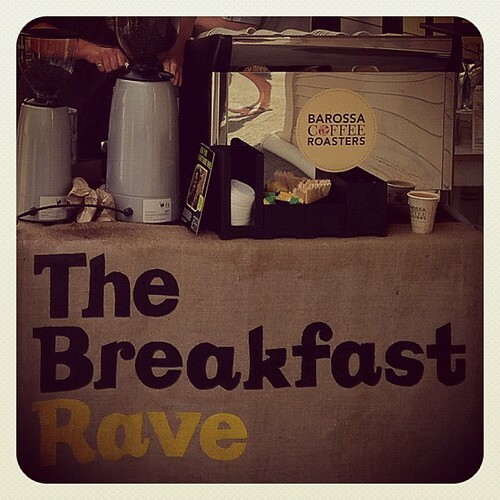 On the weekend Denis and I were delighted to visit the very first pop up "Breakfast Rave" held in the Barossa Valley. 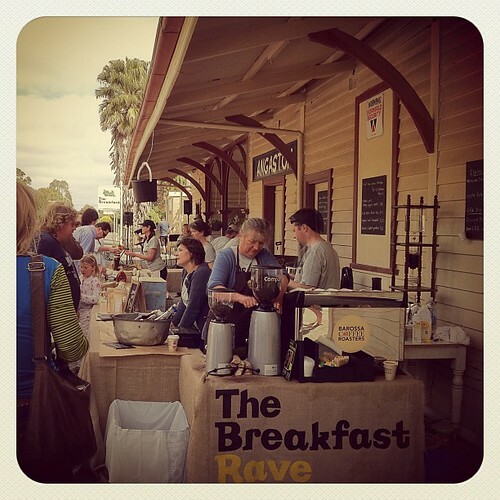 Organised by my dear friend Cherie, along a team of like minded foodies from the Barossa, the Rave is a spontaneous community event expected to pop up in various iconic Barossa locations. 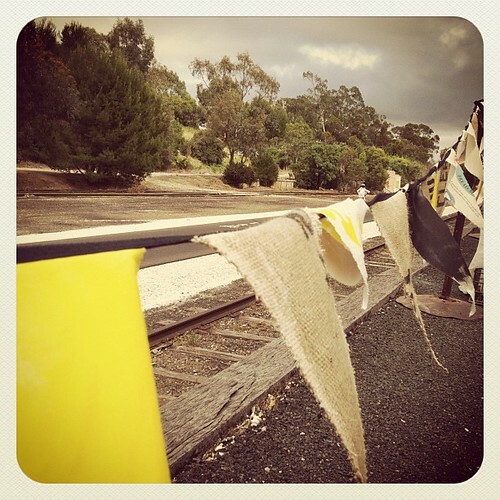 Sunday's event was held at the Angaston Train Station. No longer in use, it was the perfect backdrop for this sustainable breakfast affair. I love the fact that a new breath of life was given to this old building even if only for a day! It was such a warm and friendly atmosphere, with locals catching up, dogs happily hanging out, and kids entertaining themselves along the old train track. The train station was looking extremely well dressed with hanging baskets full of succulents, hessian table cloths, bus blind tea towels, and this gorgeous bunting made from recycled flour bags & hand printed fabric. 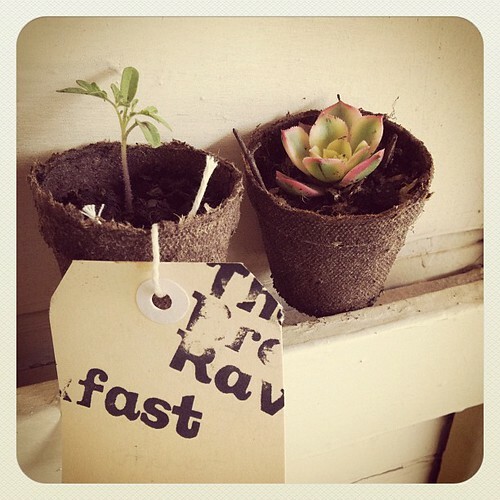 We even got to take home an heirloom tomato plant in a compostable pot as a thank you for supporting the first event! Actually the whole event was compostable ... all cups, plates, forks, bin bags and food scraps were compostable and thrown straight into the Rave's compost! I'm impressed! Breakfast was divine, Spanish style slow-cooked beans with free range poached eggs, grilled sourdough and a dollop of natural yoghurt - all for only $10. Oh yeah, top that with some coriander and chilli! Finished with a gluten free chocolate brownie by Scullery Made Tea. YUMBO! 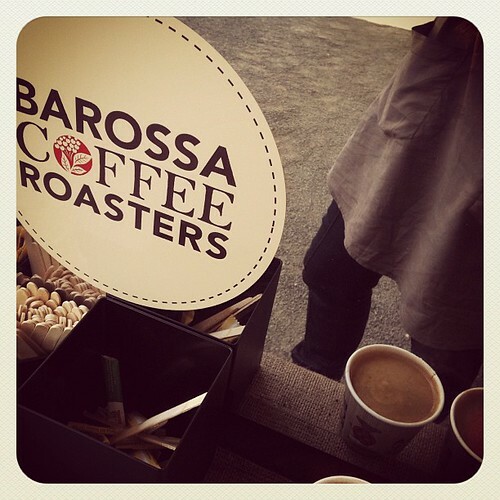 And I must say, I think I had the best Mocha I've ever had from Barossa Coffee Roasters - a big call but it is true!